A tale that explores themes of diversity, adoption, and alternative family life follows a little chick who shares a happy relationship with his loving mother, a cat with soft fur, tickling whiskers, and a long beautiful tail. 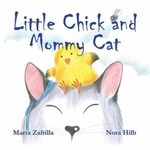 Zafrilla, Marta, "Little Chick and Mommy Cat" (2012). DIVerse Families. 155.